Apparently I am good at making holes in the finished walls. One of the extras I put in the family room bath is a small rack for a wet washcloth. It seems that without a traditional soap dish there is no place to hang a wet wash cloth. So I bought a toilet roll holder in antique brass for this. I decided to put it in the bottom small niche. But I had to drill a hole for the screw holder. Because there are no studs near here I used a toggle bolt. This is the kind that tightens against the bolt as it is screwed in and makes a nice tight connection. However I didn’t realize the bolt was longer than the wall here inside the niche! 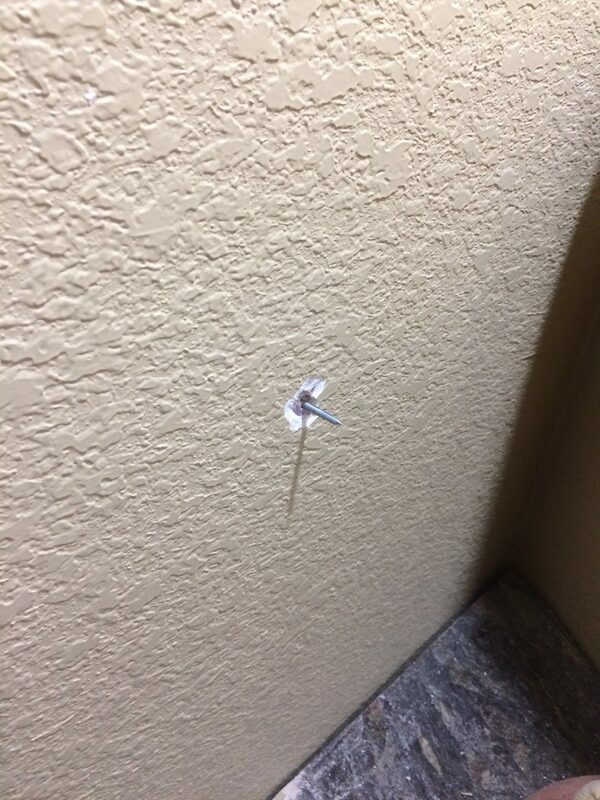 I will cut that off with my handy multitool and patch the wall. I like having a rack for a wet washcloth in the shower. I need to buy one for the master bath shower. And hopefully avoid making a hole in the wall on the other side. But the photo shows I didn’t get all the caulk cleaned off. If I missed it here I missed it elsewhere. I will have to wash the shower tile again. 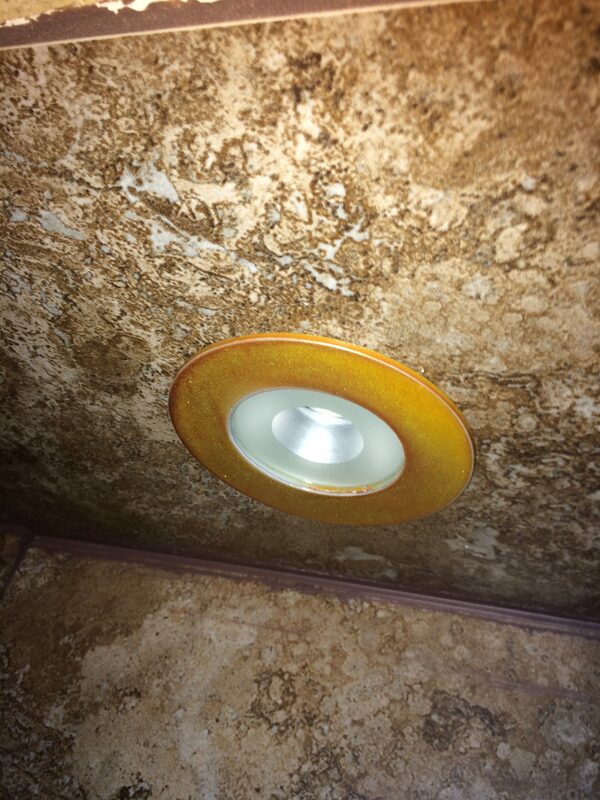 Another project was covering the bright chrome light fixture with brassy looking paint. I already had some copper colored metallic spray paint from the kitchen sink project and some gold glitter paint that I picked up because it was on clearance. The gold glitter alone did not have the right shade of brass so I primed it with automotive gray primer for metal and fiberglass. Then I sprayed several coats of the copper paint first and finished with a coat of the gold glitter. The effect is that of a toned down brass. These little extras customize the shower for us and at a very reasonable cost. 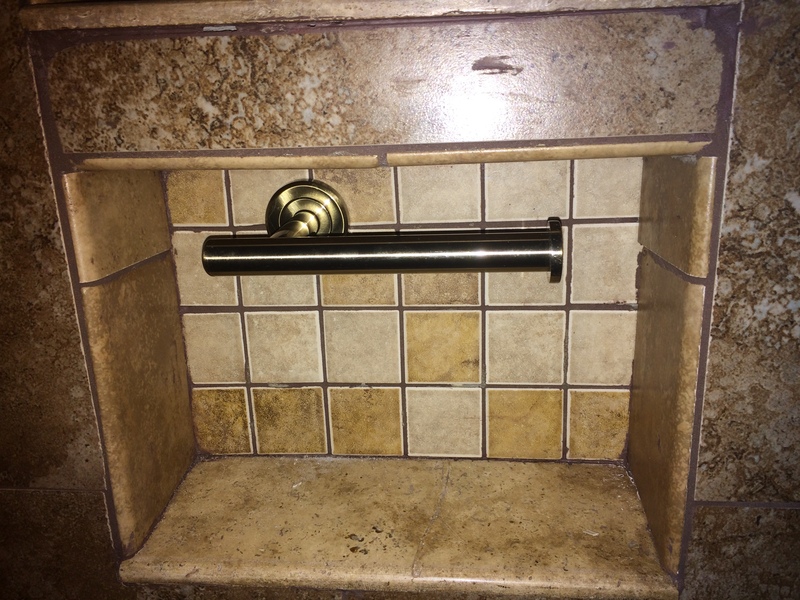 This entry was posted in -Chronological Recent Posts, Bathrooms, Trim. Bookmark the permalink.